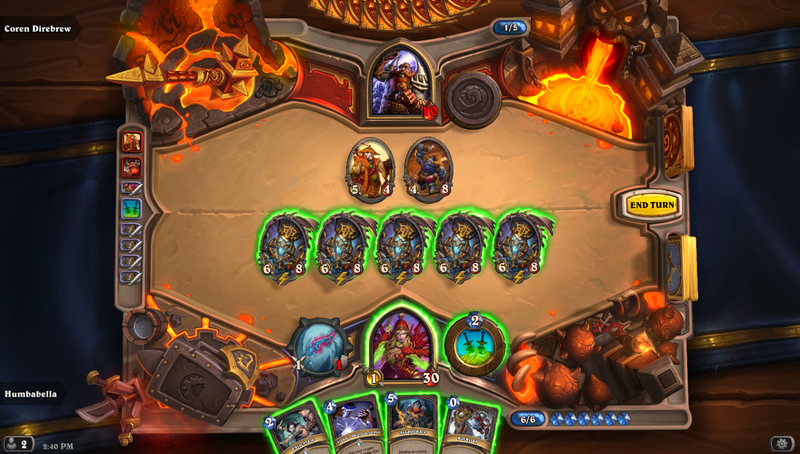 I don't play hearthstone very often, so I'm not sure why I bought the new adventure, but I did. I'm kind of glad I did, though, because I've already had a lot of fun with it. Maybe not $24.99 worth of fun, but fun nonetheless. First of all, the Mage challenge is pretty spectacular. Your opponent is the dark iron arena headed by High Justice Grimstone. His hero power summons a 1/1 taunt for one mana, which is overpowered but not overpowering. His deck, however, is entirely composed of legendary creatures, which he plays against his own interests. The fight outside the challenge wasn't very tough, I beat it with a low-budget ramp druid I had lying around. The mage challenge, however, gives you a deck of 30 Unstable Portals. You don't even get to play with the new mage card in your challenge deck. So it's random legends against your completely random creatures. I lost my first game to him getting lorewalker cho which furnished him with some portals of his own that gave him some very nice answers to the other cards I got. I won the second game, and then played several more times. It's like Momir for Hearthstone. Among the funnier things that can happen is him playing Millhouse Manastorm allowing you to blow off all of your portals at once for a handful of undercosted nonsense. I didn't feel like beating my head excessively against the heroic challenges today, but I checked out what they were. The Grim Guzzler is the first event in the adventure. In it the opponent has a zero mana hero power that they are forced to use every turn that puts a random minion from your deck and their deck into play. Obviously this is easy to beat by building a deck with about eight to ten very big minions and then all spells. I did this with a druid to get the Ironbark Protectors. Well on heroic the Grim Guzzler summons one creature for you but two for itself. Now this seemed like a challenge heavily dependent on owning the big legendaries. Deathwing - remember there are not Battlecry triggers when you don't play the creature from your hand - Ysera, Mal'Ganis, and so on. The only eight cast legendary I own is Kel'Thuzad. He's obviously a heck of a thing to get into play, but if the other things I'm getting aren't up to the task then I'm in trouble. But while going through the first three encounters, I got an interesting Rogue spell. It doesn't look very playable, and it strikes me that it's too bad it's a rogue card because it would be much more at home as a late-game control on control card: Gang Up. Why would I need Deathwing when I could just have more Kel'Thuzads? Now you might think my hand has at least one confusing inclusion, but at I had to play 29 spells to leave space for just one minion, meaning that I couldn't be too choosy. It hardly mattered, essentially I needed to play Gang Up on my second turn and then let the game win itself. In case you are wondering what happens when you have four Kel'Thuzads and your opponent takes away one, the answer is that you now how six. The reason I don't have a screenshot of six Kel'Thuzads above is because I lost a Brawl that game. Hardly seemed fair.